Chocolate candy coal. Buy a candy coal sack for those on your naughty list. You get get mesh bag of chocolate coal, Butterfinger bites lumps of coal and a Christmas pencil with a coal eraser that says Bah Humbug. 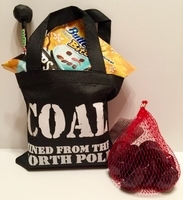 All this fun candy coal comes in a black nylon tote bag that says Coal Straight From The North Pole, tote bag is 6 1/4" x 6" with 4 1/2" handles. Candy coal is a popular gift for Christmas whether you are looking for a gag gift candy for your Christmas stocking or a gift for an Christmas exchange. Naughty or Nice a sack of chocolate coal will delight whoever gets one.